New motor technology has changed the way modern ventilators and respirators are designed, making them quieter, more compact and more efficient. New motor technology has changed the way modern ventilators and respirators are designed, making them quieter, more compact and more efficient. 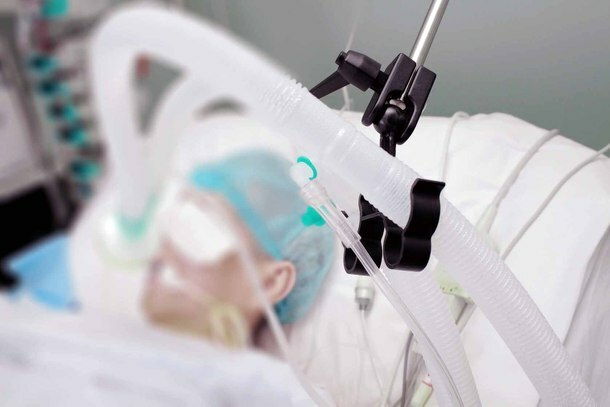 Ventilators provide temporary ventilatory support or respiratory assistance to patients in medical settings, often in critical care situations. Reliability and low audible noise generation are very important criteria to ventilator manufacturers. In 2011, engineers at Allied Motion's facility in The Netherlands teamed up with a medical systems company to design a new motor that could withstand the challenges posed by an innovative new respiratory blower: high speeds, optimal responsiveness, exceptional operating life, maximal efficiency and the ability to operate in an oxygen-rich environment. Our Dutch team achieved their goals – and right now, the ResMax 28 motor is helping people breathe easier. Allied's Dutch engineering team developed a completely new stator and rotor design for the ResMax motor. The ResMax 28 has a rotor with very low inertia that enables very rapid acceleration — from 0 to 50,000 rpm in only 20 milliseconds, unloaded. This is a crucially important element because high acceleration capability is vital in syncing with the naturally changing rhythms of respiration. This feature, together with the wide speed range of up to 90,000 rpm, makes the respirator incredibly versatile. 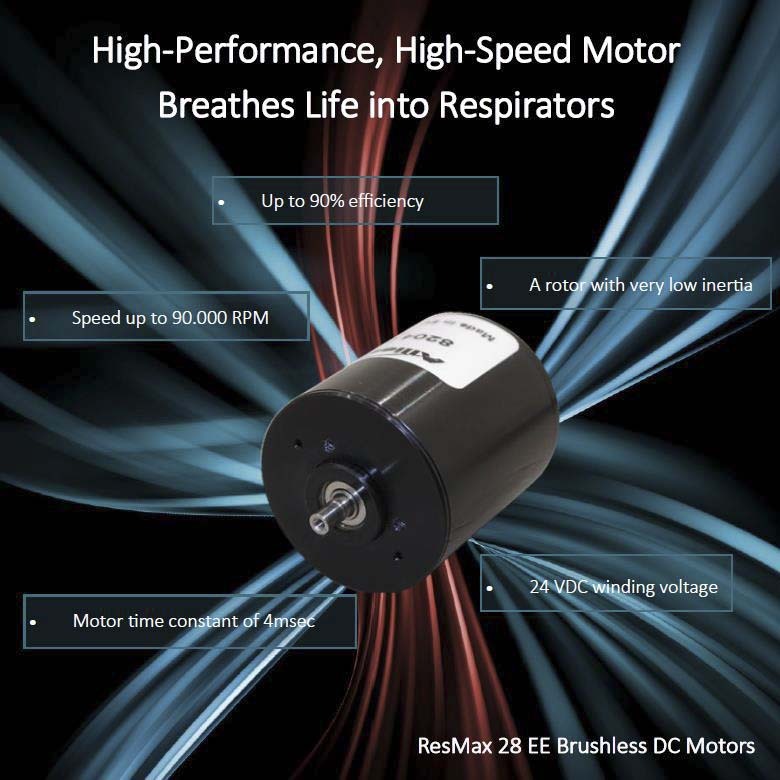 The blower that incorporates the ResMax 28 motor can be used on any patient — from a premature newborn to a burly football player — because the rapid acceleration and the wide speed range enable the unit to adjust to each patient's unique lung capacities and strengths. Reducing self-generated heat to prevent motor overheating is key to maximizing the life of any motor — especially a high-speed motor like the ResMax. Once size and speed goals were attained, the Allied Motion engineering team focused on extending the life of the motor to 30,000 hours at an average speed of 40,000 rpm. Motors with dynamic properties similar to the ResMax 28 design are usually small in diameter and have thin stator cores. Consequently, they have higher thermal resistance (which is a measure of the motor's ability to dissipate the heat it develops internally). 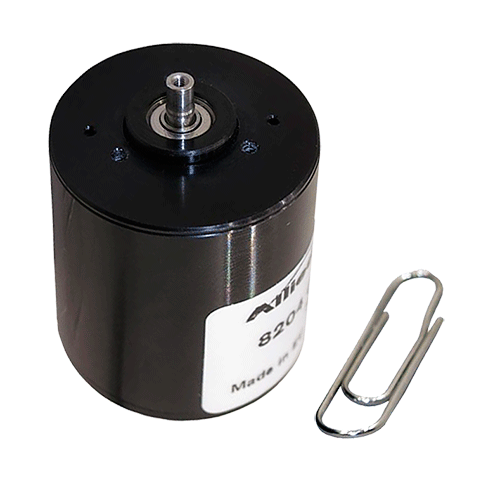 Because the stator design of the Allied Motion ResMax 28 uses a larger diameter than competitive motors, it exhibits a lower thermal resistance and runs cooler. The lamination steel our engineers chose for the core of the stator has less loss than normal lamination material, which further reduced heat dissipation, especially at high speeds. Unlike designs produced by other companies, the Allied Motion design does not need magnetic material (often referred to as back iron) around the coils. This engineering change to the stator design helped reduce thermal resistance from the coils to the motor housing to just 1.2 degrees Celsius per watt. The motor was also engineered with an integrated thermal sensor to monitor the temperature to protect it from overheating. These combined design features keep the ResMax motor cool under continuous, repeated dynamic operation and ensure the motor lasts for at least 30,000 hours of continuous operation at an average speed of 40,000 rpm. Although this motor was designed for ventilator and respirator use in a medical setting, it could also operate in other environments where there is a need for high speed and high-dynamic performance. Other applications, such as high-speed grinding or high-speed positioning of small optical mirrors, can benefit from the capabilities of this motor. An external fully customizable electronic driver package is available to enable the ResMax 28 to be uniquely tailored for other applications where high speed and extended operating life are critical criteria.